Your biggest opportunity for growth lies in maximizing your natural strengths. 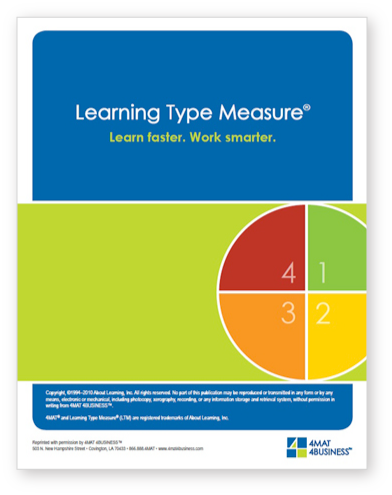 The 4MAT Learning Type Measure provides an in-depth analysis of your learning style strengths. Your learning style refers to your preferences in how you take in and make meaning of information. The Learning Type Measure explores how to maximize your strengths to position yourself to contribute at the highest level. The 4MAT model for understanding learning styles was created in 1979 by Dr. Bernice McCarthy. Over 1 million people have since discovered their learning style using the 4MAT Learning Type Measure. Your learning style preferences influence how you communicate, learn, interact, plan, coach, lead and manage. Knowing your learning style strengths will help you maximize your ability to learn new information and to produce results in the work environment. Being aware of your learning style preferences helps you interact more effectively with others including your fellow team members, immediate supervisor and customers. 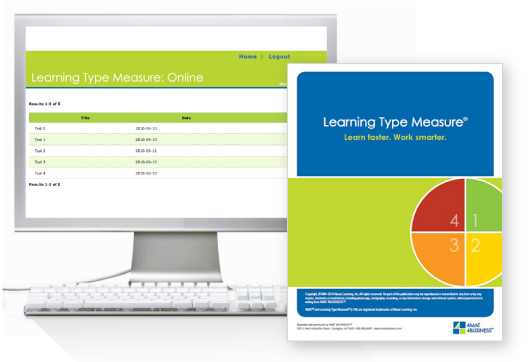 The Learning Type Measure delivers a visual display of your strengths with comprehensive written results. Understanding the learning styles of your team is important to any leader who wants to communicate effectively. Your ability to get your message across to your team can be greatly enhanced by understanding that there are significant differences in the way that people take in and process new information. Lead your team through a powerful, performance development and team building experience using 4MAT. What are My Team�s Learning and Leadership Strengths? and how to share it with you team. Already have an Online LTM account?